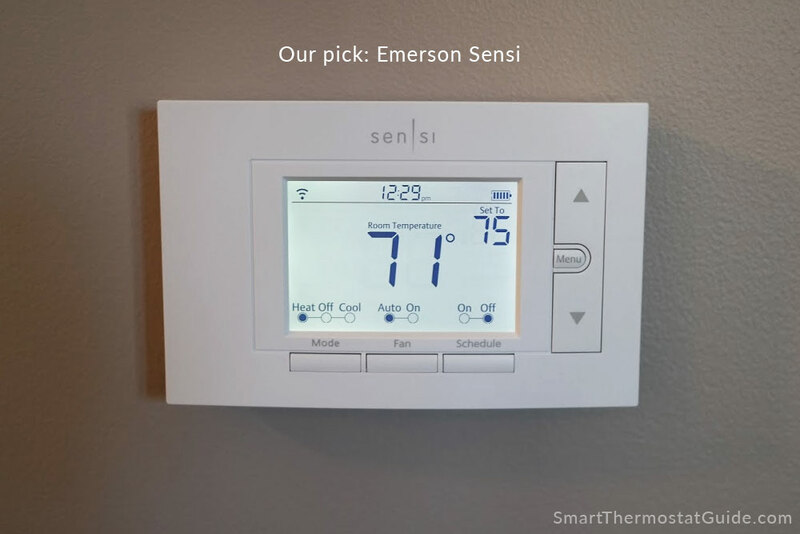 In this article: we compared the Emerson Sensi ST55 to the Honeywell RTH6580WF to determine the best budget WiFi thermostat. Today we’re taking a look at two of the most popular budget-priced smart thermostats, the Emerson Sensi ST55 and the Honeywell RTH6580WF. They’re both popular they offer WiFi connectivity and a smartphone app while still being the among the lowest-priced WiFi thermostats on the market right now. What are the the differences? Which one is better? Which one should you get? These thermostats are popular because they’re inexpensive without sacrificing the convenience of controlling them through a smartphone app. Compared to Nest and Ecobee, you can save a decent amount of cash going with one of these thermostats instead (doubly so if your home has more than one zone, or you’re buying for a multitude of locations). 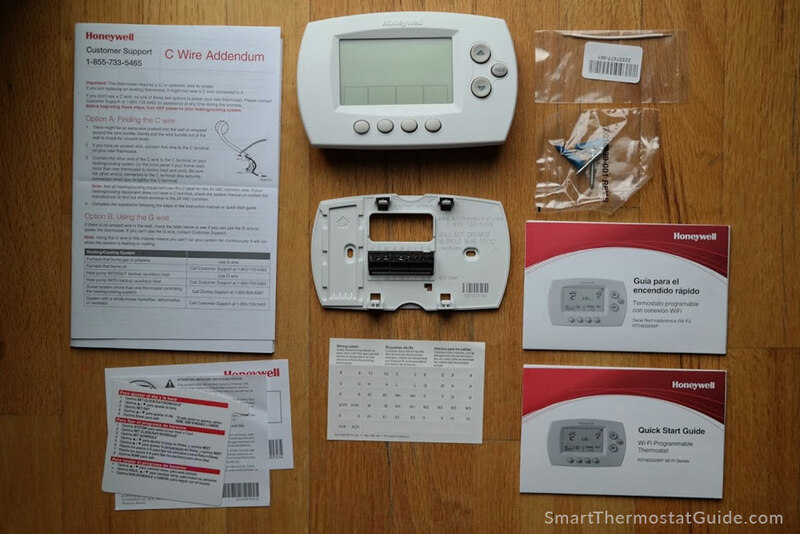 They occupy a rung just above the one occupied by purely programmable thermostats (thermostats without any WiFi connectivity) and for the most part, look and act exactly like a programmable thermostat. Depending on your needs, that might be sufficient. You’ll trade a touch screen for an old-school looking LED and there are no accessories like room sensors or families of products to hook into. 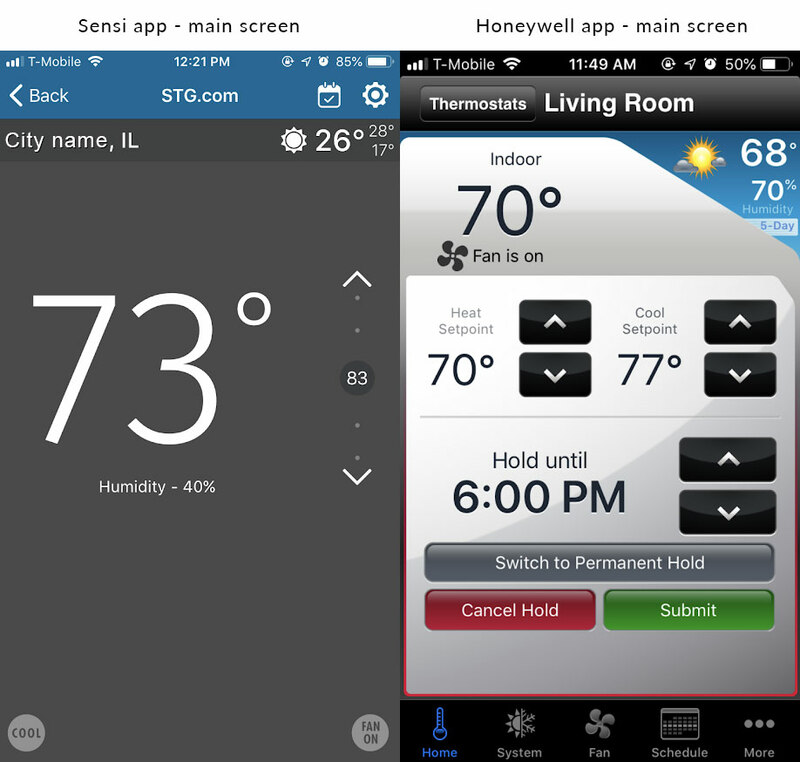 Both the Sensi and the Honeywell can be controlled by Alexa and Google Assistant, and if you use a C-wire in your installation, the Sensi can be controlled by Apple HomeKit (Siri) as well. Sensi can operate with or without a C-wire, whereas the Honeywell requires a C-wire. Most smart thermostats require a C-wire to provide sufficient powers (a couple of AAs don’t cut it against the demands of always-on WiFi and bright screens). If you find yourself lacking a C-wire and can’t add one for whatever reason, the Sensi is your best avenue to a WiFi-enabled thermostat (unless you don’t mind adding an adapter to your furnace, then you can also consider the ecobee line). 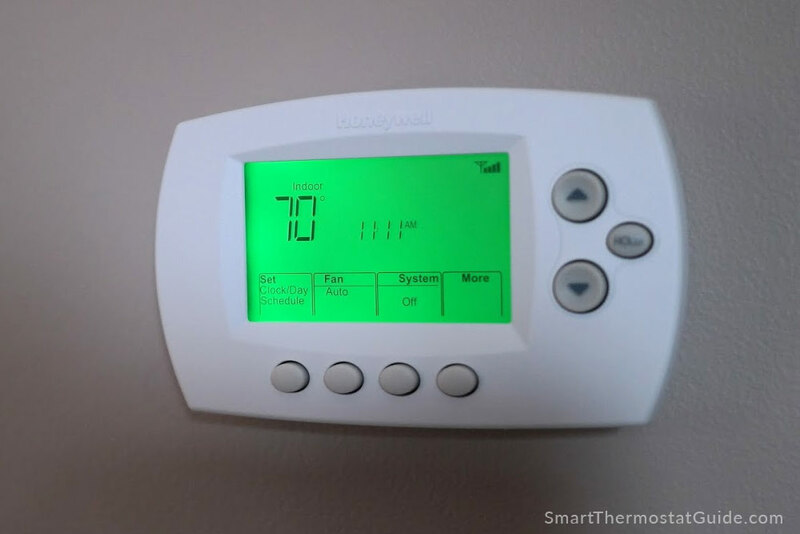 Basically, the thermostat will let the temperature of your home fall (or rise) a certain amount of degrees before kicking on the heat (or cooling) to correct the temperature back to your desired setting. A larger swing range can mean saving some cash on your energy bills (since your home doesn’t have to work as hard or as often to maintain a steady temperature), but that savings comes at a cost to comfort. A tighter swing range can mean slightly larger energy bills, but it can also mean your system runs more frequently (and in shorter bursts) than you might prefer. 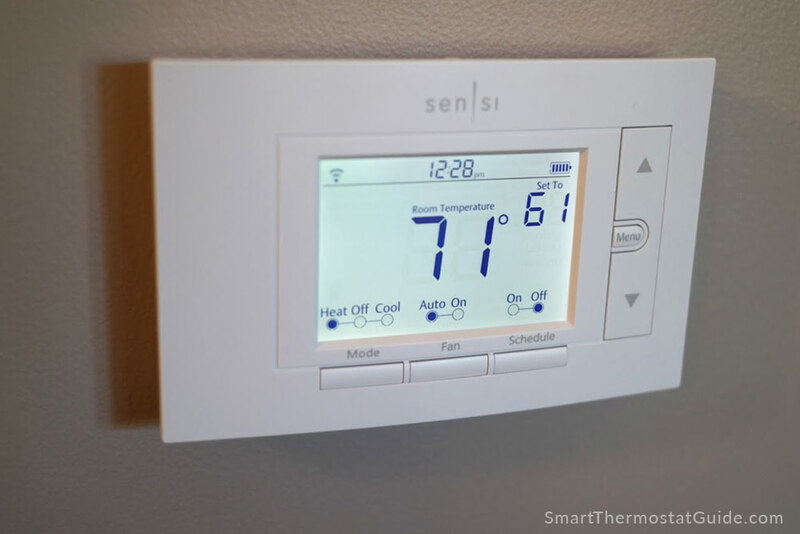 The Sensi’s cycle frequency can be customized (to an extent) via the Sensi app, but the Honeywell’s cycle frequency is forever locked at 1 degree (meaning as soon as your home drops from 76 to 75, it’ll turn your heating on to bring it back to 76). For cooling, the Honeywell cycle frequency is locked to a maximum of 3 cycles per hour. In a very hot climate, this might not be enough. Sensi has an “early start” feature. Tell it what temperature you want the house to be at and when, and it’ll start the heating (or cooling) process ahead of time so that the home is comfy when you want it to be. The Sensi app design is years ahead of Honeywell’s. We don’t mean just in terms of colors, layout, and overall aesthetics. When we were setting up our Sensi and our Honeywell, we had far fewer troubles during our Sensi setup thanks to a scannable code (just snap a pic with your phone) and a simplified account creation process. With our Honeywell, we ended up trapped in a cycle of attempting to register the thermostat, failing, waiting on an email to be sent, trying again, struggling to create a “Location”, website styling issues when viewed on our phone, and more. Aesthetic differences. The Sensi has a slightly more modern look to it. One noticeable difference: the Sensi’s screen light glows a soft white and the Honeywell’s screen glows a bright green. TL;DR: We liked the Sensi better, but read on for an in-depth comparison of features and usability. Cycle rate Customizable as “slow”, “medium”, “fast” +/- 1 degree of the current heat set point, and cooling is set to a maximum of 3 cycles per hour. Both thermostats were easy to get on the wall. They both come with two screws and two plastic drywall anchors that should be suitable for most DIY installations. As a nice bonus, the Sensi’s backplate has a built-in bubble level. Both the Sensi’s backplate and the Honeywell’s backplate have the kind of terminals that hold the wires in place using a tiny screw. You’ll need a tiny screwdriver to loosen the terminals and re-tighten once the wire is in place. Compared to Nest and ecobee, where you can easily push the wires into terminals that “catch” the wire and hold them in place, this screw-in step was cumbersome for my large, clumsy fingers. Sensi is way easier to install and make an account on the fly. It was effortless, thanks to the ability to take a photo of a code and let it handle all the network configuration and account setup. It was very easy to get the Sensi up and running. Unfortunately, we did not have the same great experience with the Honeywell thermostat. The app seemed to assume we already had an account, and the only way to make one was to get to the website via “Forgot Password”. We made an account, but the website failed at locating us automatically. We tried to enter our location manually, but that seemed to break the styling on the website – we ended up with a lot of overlapping text elements and it was borderline unreadable. 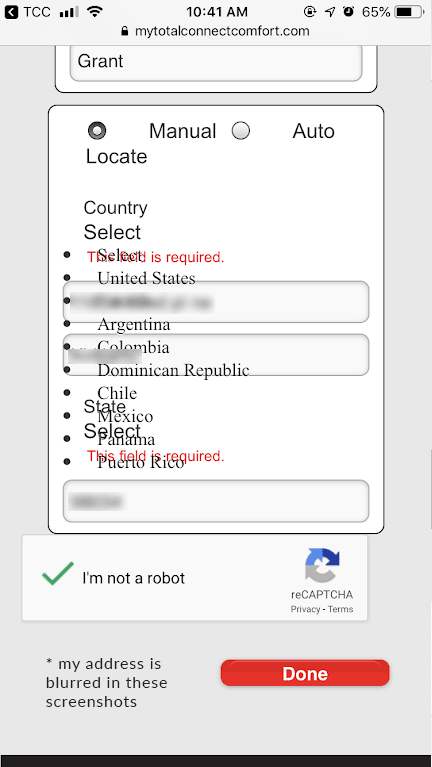 Entering the device’s MAC ID was tedious on mobile, and we had to do it several times. 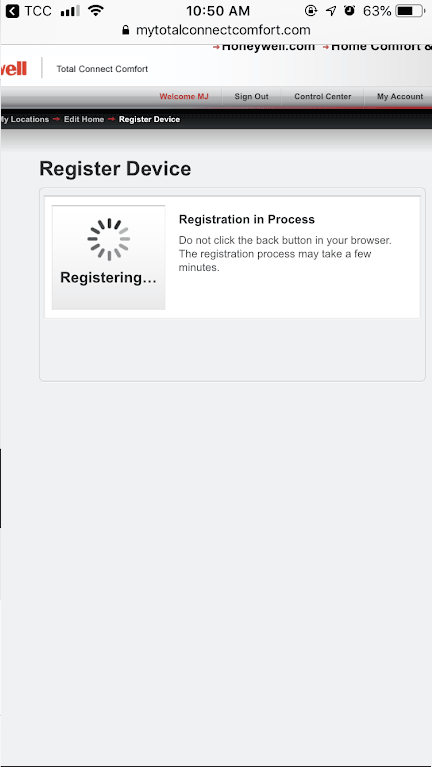 We spent about an hour going back and forth between the app trying to set up a location and register the device, and it just never went through. We had to use the “Manual” location entry option on the mobile version of the mytotalconnectcomfort website, which had some styling troubles on our device. Registering our thermostat never actually finished, despite multiple attempts. I wonder if our MAC ID was already in use and ours was returned merchandise? We got stuck here: the app won’t do anything without a thermostat installed, but the website won’t register our thermostat or tell us what’s wrong with it. This was such a cumbersome process compared to competitors who let you scan a QR code or just ask for an email address and password for account creation. 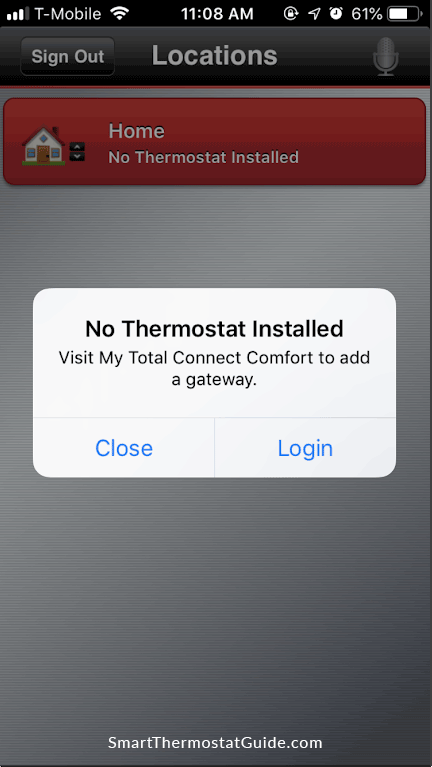 We had to use the “Demo mode” to get a feel for what the Honeywell app offers, and we regret that we weren’t able to test the thermostat as much as we would have liked.The app and website don’t realize you’ve failed and attempt to “rescue” you or redirect you in any way. We were puzzled by some of the terminology (add a “gateway”?) and frustrated by the poor mobile website presentation. This experience confirmed our suspicions that Honeywell isn’t focusing on the user experience aspect of their products right now. They’re both white plastic rectangles(-ish) with LED screens and big chunky buttons that feel good to push. The units and their screens don’t matter too much, though, since 99% of what you do with the thermostat you’ll probably do via the app you download during installation. Both are white plastic with buttons, but the Sensi looks better, in our opinion. The buttons are sleeker, flatter, and the unit has a sculpted look that feels more modern. Both have LED screens. The Sensi has a dedicated button that lets you turn on the illumination (and if you have a C-wire in your installation you can elect, via the app, to leave that light on 24/7). The Honeywell’s screen lights up green in response to button touches. We thought the Sensi’s white glow looked better than the Honeywell’s green glow, but this is just personal preference speaking. Both of these thermostats are meant to be controlled primarily through their apps, rather than from the units themselves. The apps are similarly featured, letting you accomplish the same tasks via your phone: scheduling the thermostat, locking the thermostat to button presses, activating a hold, viewing local weather conditions, and adjusting system settings. We liked the Sensi’s app better: its look-and-feel is cleaner and more in line with modern design sensibilities, but both apps got the job done. Setting up a schedule (and editing existing schedules) is the bread and butter of thermostat apps. 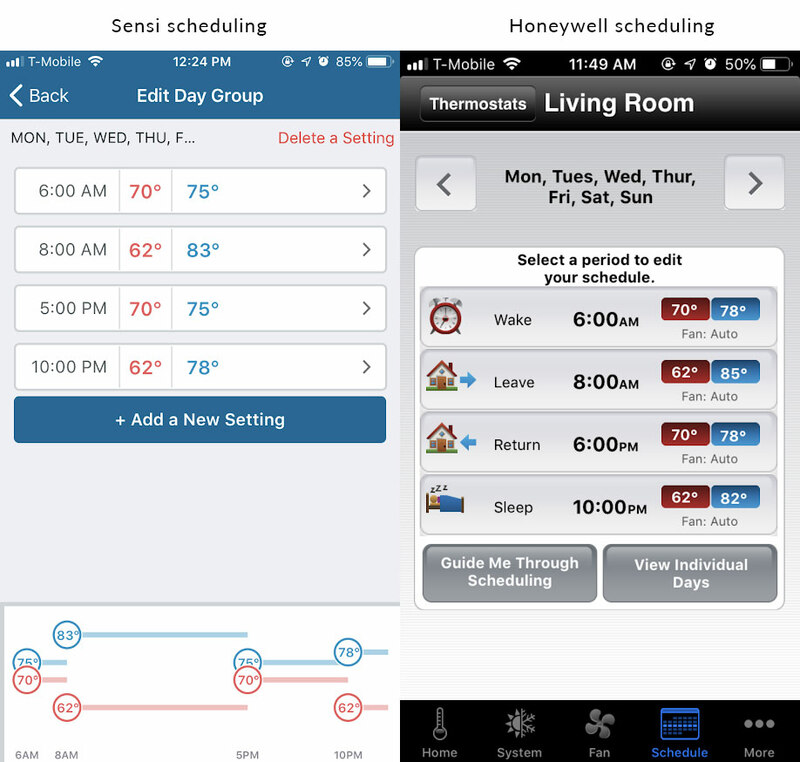 Both the Sensi app and the Honeywell app made this easy to do, letting you copy and paste a schedule from one day to another, or letting you schedule several days at once. The Honeywell thermostat and app seem to assume you live a typical schedule of waking, leaving for the day, returning home, and going to bed. If you, for example, come home for lunch in the middle of the day, you’ll find yourself manually overriding the schedule because there’s no way to add more than 4 adjustment periods on the Honeywell. Meanwhile, the Sensi lets you add more than 4 adjustment periods (to cover that “going home for lunch” scenario). It also supports geofencing as an alternative to setting a rigid schedule. Sensi’s geofencing is labeled “beta” so some glitchiness is to be expected, but it’s nice to see this upper-tier feature making its way down to the budget-level models. The Sensi app is where you control things like locking the on-unit buttons, the temperature offset, the swing range (cycle rate), and turn on features such as boost and A/C protection. The System Settings section of the Sensi app gives control over the cycle rate and lets the user turn on additional features, such as Boost and A/C protection. The most noticeable irritation with the Sensi is the audible clicking sound it makes when the thermostat calls for heating or cooling. The sound is from the relay opening and closing, and it’s definitely noticeable if you’re in the same room as the thermostat. 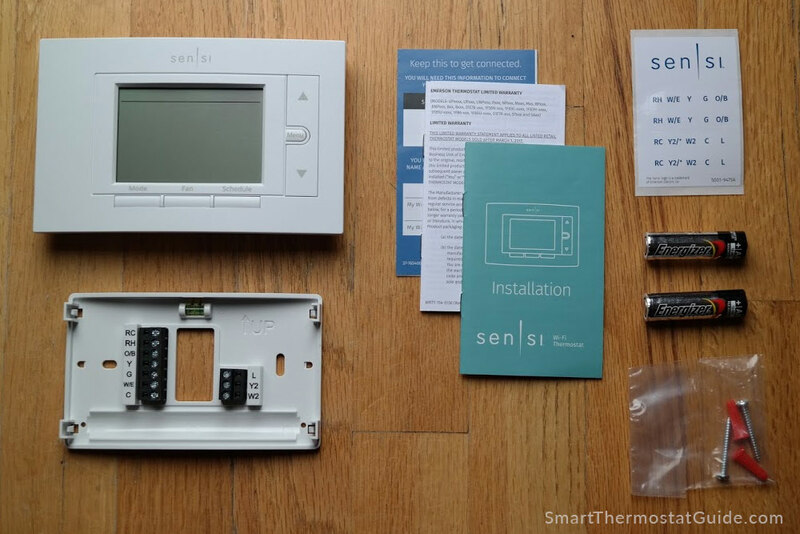 This is easily our biggest (only, really) complaint about the Sensi, and it’s such a shame because the thermostat is fantastic otherwise. We use the room with our thermostat in it as a guest room / TV room, so hearing the thermostat go click… click… click… is borderline maddening. (Note that some people are better at ignoring the click than others.) We did not notice similar clicking on the Honeywell RTH6580WF or on the pricier Nest and Ecobee models we’ve evaluated. The Sensi gets a lot of accolades for working without a C-wire, but there’s some nuance to that claim: if your system is heat-only or cool-only, or you want to use Apple HomeKit, then you will need a C-wire after all (or you might be able to repurpose an existing wire or get an Add-a-Wire adapter). A major drawback to the Honeywell RTH6580WF is the strict C-wire requirement. It’s such a simple, no-frills device, so we were surprised it needs a continuous supply of power (especially since the Sensi does not). Another common complaint is that the Honeywell won’t join your network if your SSID or WiFi password contains characters other than numbers and letters (so no %, !, #, @, etc). 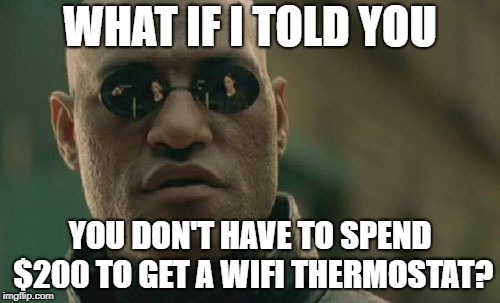 This is a blatant design oversight and it’s frustrating that Honeywell didn’t account for this (or even document it anywhere – if your Honeywell WiFi thermostat won’t connect and you don’t know why, it might be because your network name or password contains non-alphanumeric characters). This no-special-characters thing kind of segues into a larger complaint we had about the Honeywell as we used it – the usability and design just isn’t in line with that of competitors in this space. You have to set the clock yourself (why can’t it get it from the Internet? ), the app looks straight out of 2005, it’s restrictive in its idea of what constitutes a schedule – little stuff like that adds up to make a less-than-awesome user experience. One final frustration: you can’t adjust the cycle rates (also called “temperature swing”). Honeywell responds to complaints about this by saying they want comfort to be paramount but we think being able to set the thermostat to suit your preferences is actually more important and don’t like being locked into a particular cycle rate. Some users report that the cycle rate is simply too frequent (especially for heat) and too infrequent (for cooling) and they can’t do anything about it. The Emerson Sensi ST55 is our pick. It’s got more features, better customizability, and an better user experience than the Honeywell RTH6580WF. It’s also a great option for homes that lack a C-wire but have both heating and cooling systems. The only real downside is the audible click it makes when calling for heating or cooling, but depending on where your thermostat is located, you may never even notice. Next: Next post: What is geofencing and how do smart thermostats use it?